Congratulations to Efren Peñaflorida for winning the CNN Hero of the Year. 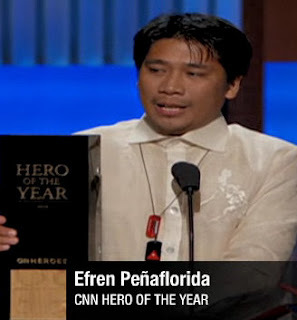 Efren Peñaflorida, who started a "pushcart classroom" in the Philippines to bring education to poor children as an alternative to gang membership. On the awards event, Efren wore a Barong Tagalog with an embroidery of the Philippine Map designed by Rhett Eala for C2.